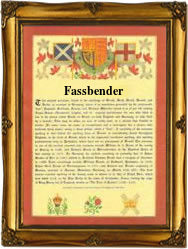 Recorded in a large number of spellings and forms including Faas, Fass, Fasse, Fassman, Vass, Vasse, Vassman, Fasler, Vasler, the compounds Fassbender, Vassbender, and Fassbindler, and others, this is a surname of Germanic origins. It derives from the ancient pre 7th century word 'fas or vas' meaning round, and as such was used in early medieval times to describe a barrelmaker or somebody who dealt in barrels. The surname may also have originally been a nickname for a rotund man or probably given the very robust humour of those times, the complete opposite! It is also claimed that this surname as Fass or Vass was a short form of the Roman (Latin) names Gervasious or Servatious, although we have not been able to establish any clear link. Early examples of the surname recording taken from surviving rolls and charters of the medieval period include such examples as: Burcardus Fasman of Frickengen in the year 1249, Hainrich Vasseler of Freidingen in 1386, and Hans Vasle of Saulgau in 1405. Surnames became necessary when governments introduced personal taxation. In England this was often known as Poll Tax. Throughout the centuries, surnames in every country have continued to "develop," often leading to astonishing variants of the original spelling.